It’s that time. The end of the week, when young people throughout the world drop the suits and business attire to put on more revealing clothing, in an attempt to dance, throw back some drinks and mingle with other people. The best place to do this is at a nightclub, but if you’re an owner of one of these nightclubs, you know that a huge part of reaching out to these younger crowds is having a strong online presence. 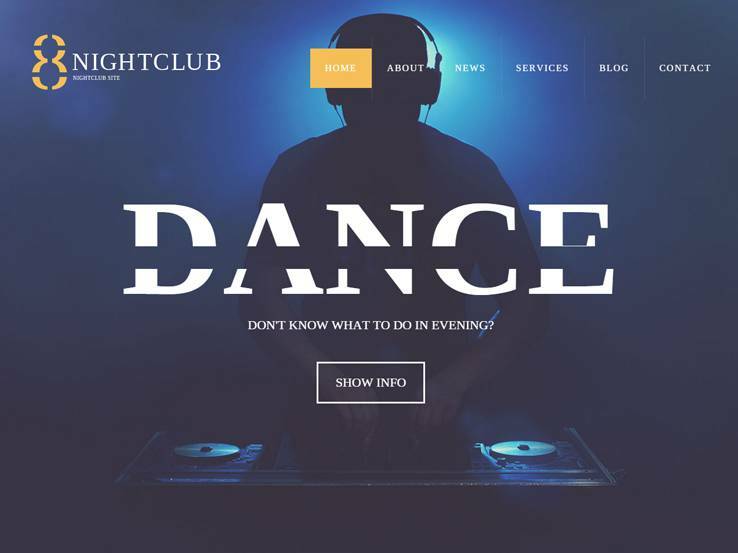 Whether you have an established nightclub with an outdated website, or you’re brand new to the game and would like to come out with a punch, a WordPress theme for nightclubs is the best route you can take. Why is this the case? You don’t want to spend thousands of dollars asking a developer to build your site from scratch, especially since these themes are already ready for you to launch within minutes. Nightclubs require a wide set of features, and the theme designs generally move towards the more modern and dark colors, reflecting the mood that people can expect when arriving for a night on the town. 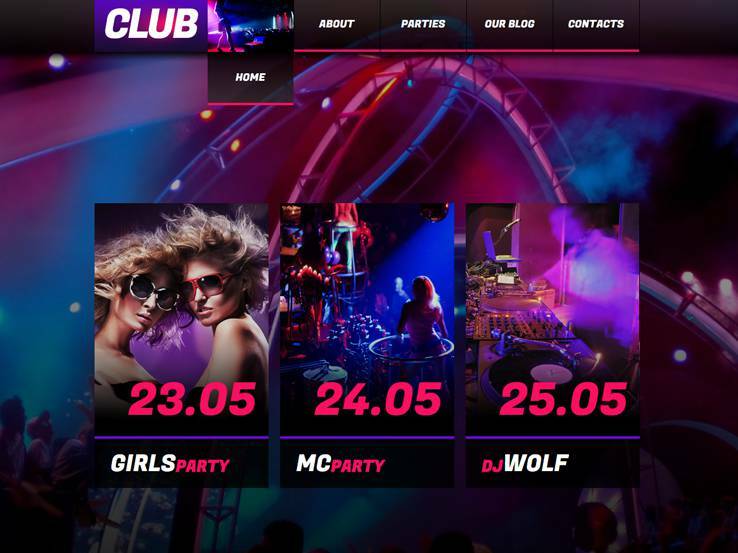 You’ll also notice that many of the top WordPress nightclub themes include features for booking, events, contact forms and more. You’ll be able to share photos from past nights, along with information about DJs and bands that are coming to entertain the crowds. Overall, you have a wide selection of nightclub themes to choose from online, so we’ve done the work for you and found the best ones to go with. 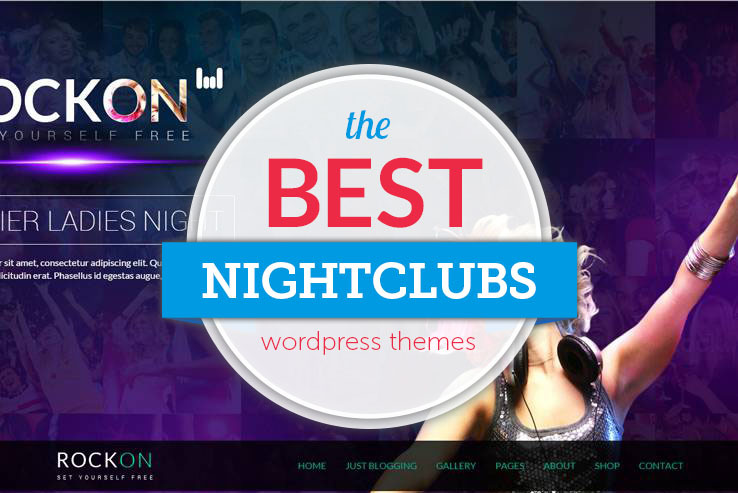 So, without further ado, we present to you the best WordPress themes for nightclubs. The Hernan WordPress theme is the first one of the bunch because it has modern, sleek elements and a darker color scheme for depicting a typical atmosphere of a nightclub. The responsive theme works on all mobile devices, which is huge for your younger crowds. The discography management is built for bands, but nightclubs can use it to show off clips from performers who are scheduled to come into the nightclub. The event management tool is great for featuring what shows are coming up, along with details, pictures, and contact information for those who are really interested in coming. Six content types are what make this theme ideal for nightclubs since they allow you to add a slider, which you can use to showcase images of your nightclub and people having fun throughout the week. Showcase your artists and events and use several types of media to engage people who come to your website. The flexible layout options are ideal for displaying things like recent news, media, and other personalized content for people to look at. Custom widgets work well for social media purposes, since you can implement social sharing and following buttons, along with widgets that show Twitter feeds and Flickr pictures. Hernan is a completely SEO optimized theme and it provides translation files, which is great if you plan on marketing your nightclub worldwide. A blog is included with the Hernan theme, boosting your SEO and allowing you to share updates with those interested in visiting your nightclub. Shortcodes are included with the theme, allowing you to add buttons, columns, accordions, and more without touching a single line of code. The majority of the homepage is catered to placing widgets on it. This comes in handy because you get somewhat of a drag-and-drop interface. 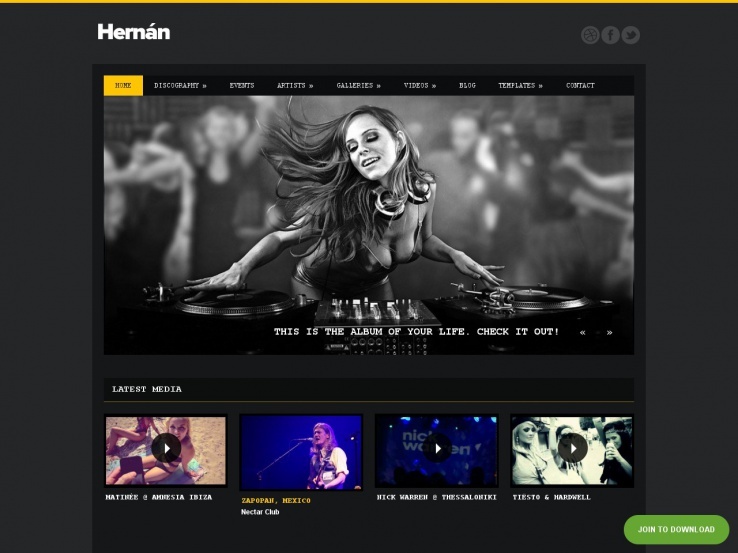 Along with great support for media and a beautiful contact form, the Hernan WordPress is one of the top options for nightclubs. Try out the Vocal theme if you’re interested in a nightclub theme with darker colors and a few premium plugins included. The theme includes the premium Visual Composer plugin, which turns your backend into a drag-and-drop editor. You no longer have to know anything about code to develop your website, which decreases the amount of time you spend on your site, while also making it easier for designers who make lots of websites for clients. Vocal comes with WooCommerce support, in case you’d like to start selling merchandise or tickets for your nightclub. You can also connect the theme with MailChimp, which allows you to grow your email list and send out emails for special events and new artists. The one-page layout is exactly what you need in this digital age since users can easily see all the information in one place. Event listings and details come in various formats, so you can display images, information, and locations, all with the click of a button. The Vocal theme includes page templates such as a performer, album, and gallery pages, which are wonderful for featuring the performers who are coming to your nightclub and building a buzz. This is also essential for giving out samples of music and other content that helps make your nightclub more popular. The event grid layout works well for organizing your content and the responsive design is required since many people nowadays prefer using their mobile devices. Six predefined color sets are included with the Vocal theme, making it easier to integrate your brand and showing that you don’t necessarily need a darker color to reflect the atmosphere of your nightclub. The audio player is built-in and you can upload video from places like YouTube and Vimeo. The events module has a section for ticket pricing so you can inform visitors on the prices for certain events. Consider the Oscillator WordPress theme if you need a grungy look with clean elements. As with most of the themes on this list, the Oscillator theme is mobile responsive, allowing people to view your events on mobile devices. The truly unique design is built to promote your nightclub in style and the streaming audio player has the tools to showcase artists who are coming to your venue in the future. Six post types are included the Oscillator theme, including a slider for displaying some of your high-resolution images. Talk about your artists and their discographies and compile a gallery with videos or photos to give people a visual look into your nightclub. The event page is one of the most important areas since it has support for media and descriptions, along with pricing fields to keep everything transparent. The drag-and-drop homepage is a nifty feature since you don’t have to know anything about coding to make your site look professional. Simply drag elements, such as a slider or button, onto the homepage. Nightclubs perform fairly well on social media so it’s essential to utilize many widgets that come with the Oscillator WordPress theme. Twitter and Flickr widgets are provided, and you can try out social sharing buttons to spread the word about your business. SEO optimization is built-in and useful translation files make it easy to connect with foreing speaking audience. The header area offers a slider and a huge image module with overlaying text and buttons. This works wonders for selling tickets and you can even complement it with a play button for your artist tracks. The Events v2 theme is all about organizing, displaying, and distributing information about your upcoming events. It offers key features like recurring events. This way you don’t have to keep going back to make new events for events that repeat on a regular basis. Visitors can also submit events if you want and widgetized homepage works similar to a drag-and-drop editor that allows you to implement sliders, images, buttons, and more. Google Maps is included with your theme, helping people find your nightclub. In addition to that, customizable submission form enables you to add any information you need from event submissions. The Facebook integration is a huge plus and the translation files expand your market to people who don’t speak English. Users can RSVP to events and the theme lets you maintain a regular blog to improve your search engine optimization and reveal fun content for your users. A complete coupon system comes with the Events v2 WordPress theme, meaning you can sell promotions and have people enter coupon codes when they checkout. The theme has complete email control and the homepage includes a module in the sidebar that allows people to search for events that are coming up. This makes it easy for visitors who want to locate a certain artist or see who is playing on a particular date, to enter a few details and hit the Search button. 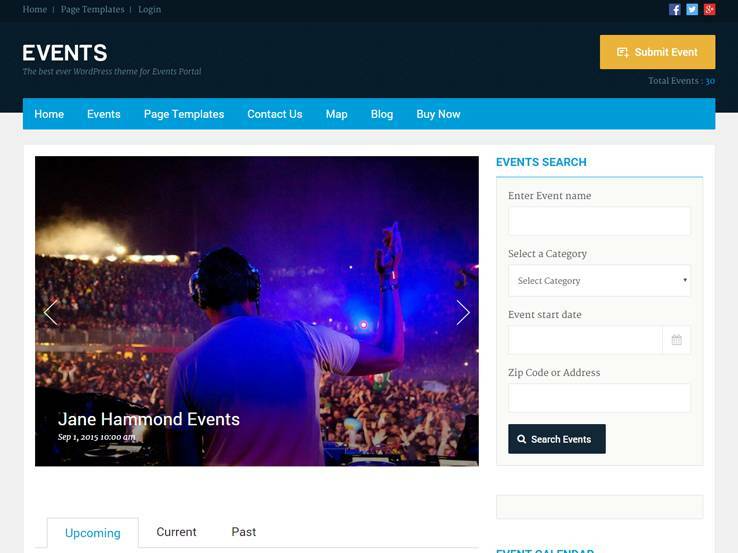 Along with a newsletter subscription form, several shortcodes, a Buy Now button and more, the Events v2 theme is a great choice if your nightclub has events on a regular basis. 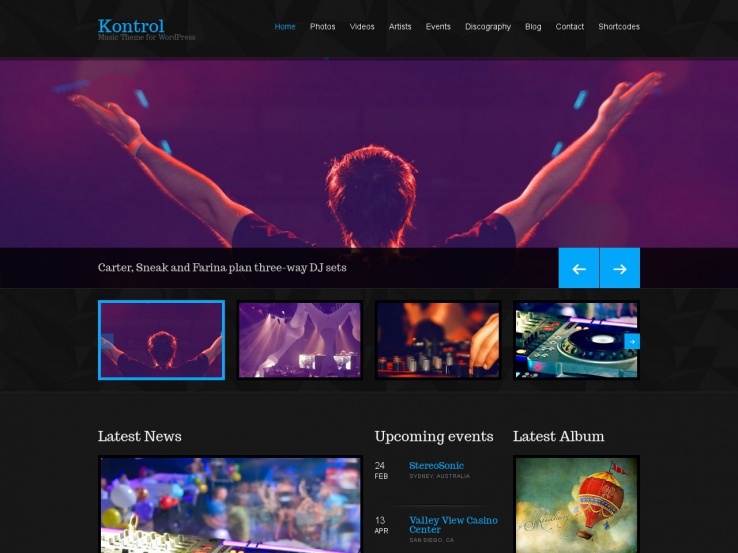 Kontrol is a powerful WordPress theme for DJs, music artists, bands, radio stations, and anyone else in the music business. The theme offers a complete discography and event management so you can easily promote your newly released albums and your upcoming gigs. 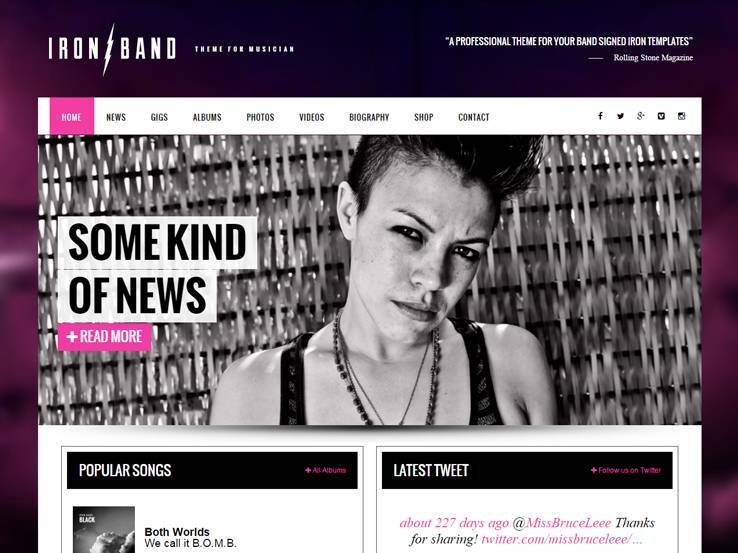 The homepage has an interesting grid layout with plenty of space to feature different artists or members of your band and you can also include a Twitter widget so your fans know where to follow you online for the latest updates. A huge slider is a great way to include images from your latest tour or a concert and you can also take advantage of image galleries and video support to include promo videos for your songs. Several custom widgets allow you to easily insert social media feeds, Flickr galleries, recent posts or songs lists, and much more. Create your events intuitively, configure dates, time, location and venues. You can also embed your track lists anywhere on the site. The theme options panel has all the tools necessary for color and font changes so you can customize your site to match your band’s colors. On top of that, the theme includes SEO optimization as well as a blog page so you can share everything that’s going on with your band and boost search engine rankings. 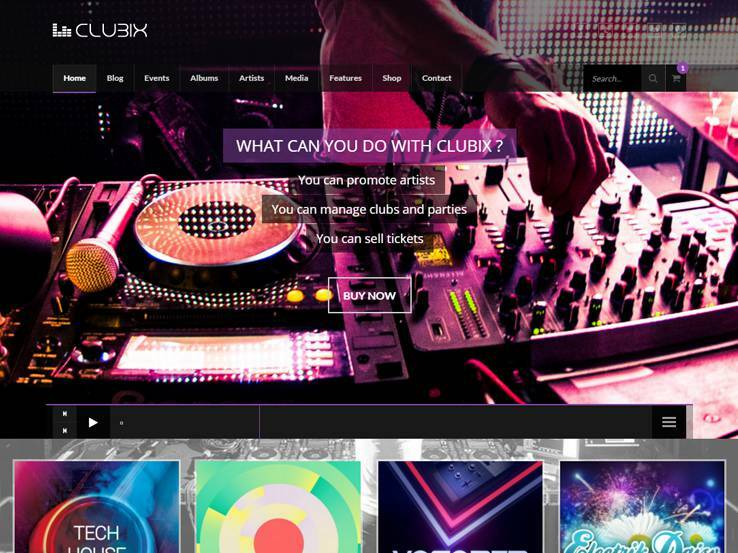 Consider the Clubix theme if you own a club and want an impressive theme to show everything your club has to offer. 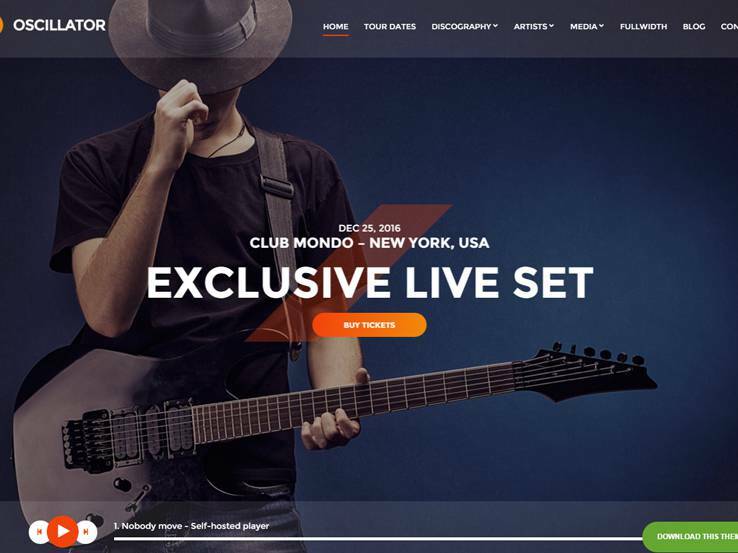 The homepage includes a large slider which is perfect for promoting upcoming events or bands that will be performing at your club. The slider also supports text overlays and call-to-action buttons which prompt visitors to purchase tickets for the event. You can also create various playlists and albums and include them on your website so potential visitors know what to expect when they come to your club. Feature different artists with their bio information and their discography. Creating recurring events is easy with this theme and you can also tweak the layout for any page through Visual Composer plugin. Light and dark color schemes are included but you can easily customize them to match your brand through the theme options panel. What’s more is that the Clubix theme offers full WooCommerce support so you can sell not only tickets for your events but club merchandise as well. You can also translate your entire website to attract a wider audience. Finally, the Clubix theme is fully responsive so your visitors can easily see what artist will be performing even while they’re on the go. 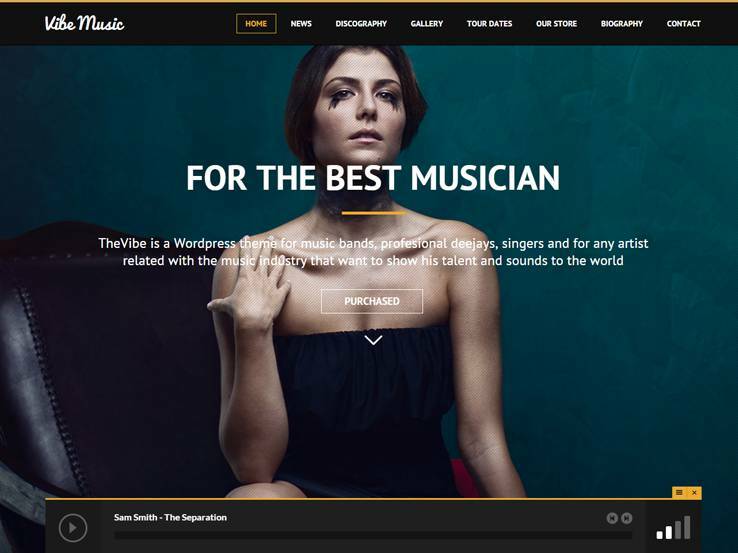 The VibeMusic theme is a great option because it comes with features to showcase the bands and artists coming to perform at your nightclub, an audio player and albums module, an events module to present your upcoming shows/performances, beautiful homepage sliders with overlaying texts and buttons to drive people further into your website, and a gallery to showcase photos and videos of your establishment. 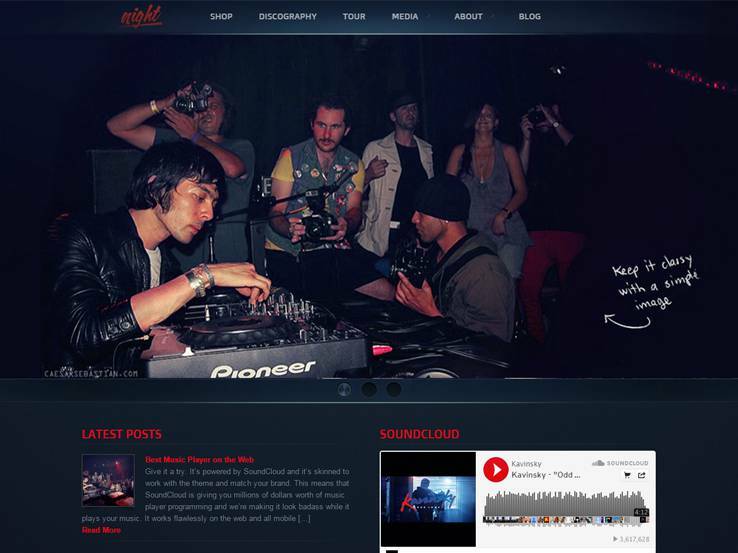 Use the Blog to share updates with those interested in your nightclub and generate more traffic to your website. We also like the customization options present in this template. It comes with the option for a one-page or multi-page website, a visual page builder to easily create custom layouts, and eCommerce support so you can easily sell merchandise and accept payments on your website. 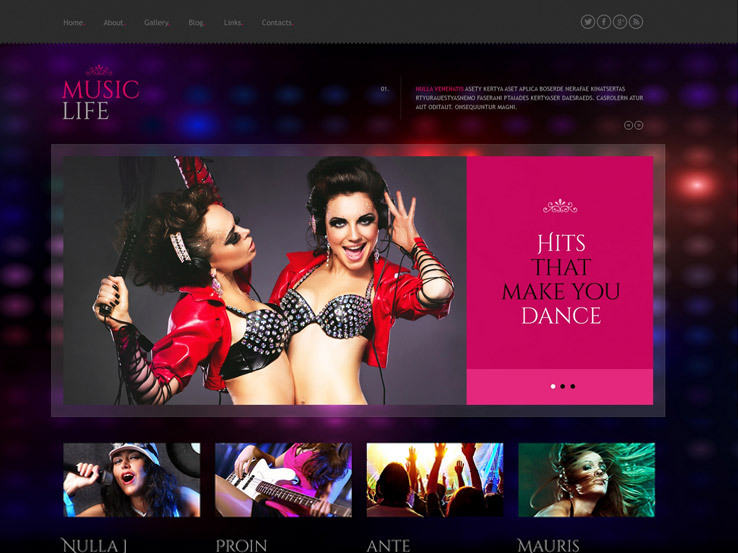 The Party theme offers the perfect look and feel for night club websites. It has a casual feel with dark colors and big bold elements. Implement video backgrounds to create the perfect party mood and upload photos of your night club to the gallery and offer a sneak peak of what revelers can expect when they visit. Most of your target market is already on social media so it’s ideal that the template integrates nicely with platforms like Instagram, Facebook, and Twitter. Furthermore, you’ll find an events module to show people whats coming up and a blog to share updates and news about your nightclub. The Rockon theme comes with several interesting demo versions – a dark version, a light version, a wine version, and a beer version. 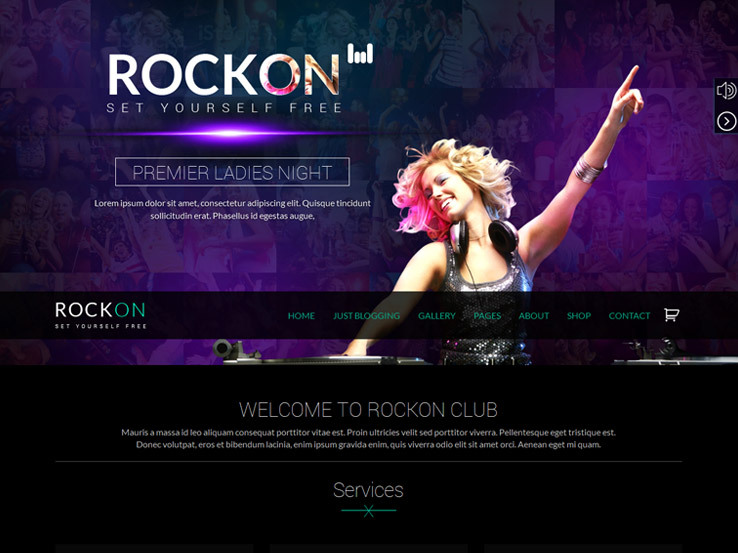 All these designs are ideal for your night club or bar website. You’ll find beautiful header styles with interesting animation effects, an events module to present your upcoming shows, galleries to showcase photos of your club, and social integration to easily connect with your fans on different platforms. The template offers some nice music related features. It allows you to feature tracklists and let people listen to music as they browse your website. Besides, the Rockon theme is eCommerce friendly and fully responsive for the perfect look on mobile devices. 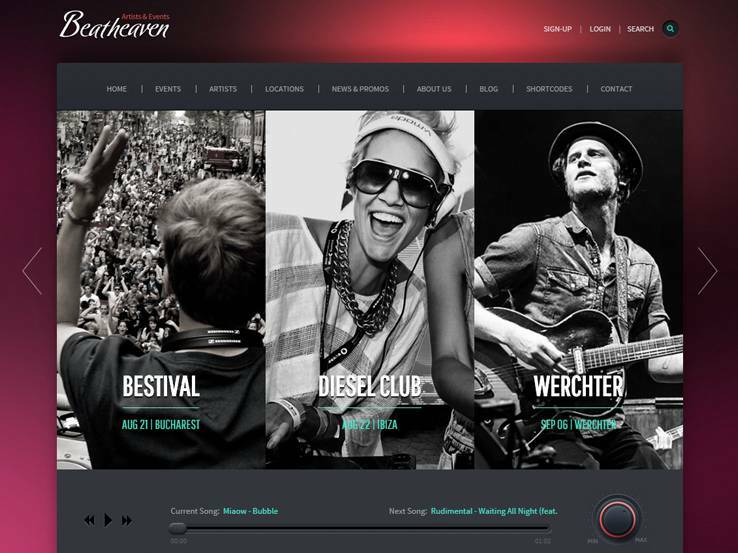 Coming from Themefuse is Beat Heaven, a stylish WordPress theme with impressive home sliders and layouts, an events module to keep people in the loop about what’s coming up, an integrated audio player, and video support. The responsive design ensures your website works perfectly on all devices and screen sizes, while the included contact form module makes it easy for people to get in touch. The blog is the perfect section to share updates and news about your night club, while the sidebar presents a spot to display things like calendars, social media feeds, testimonials, and more. Also, the theme’s back-end has many user-friendly customization options including icon fonts, layouts, shortcodes, and custom widgets that will make your life much easier. The Night Spot theme is appropriately named because it was designed specifically for night clubs. It comes with refreshing dark colors, captivating home sliders, a nifty events management system with an events counter, music track and album management, and a sticky music player to entertain people as they browse your website. You can display upcoming events along with a list of artists coming to perform. 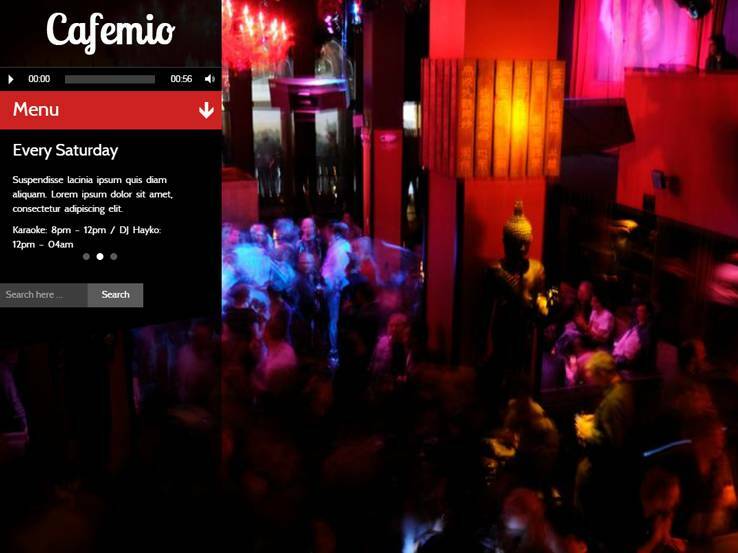 Showcase photos of your night club using the gallery module and add testimonials for the ultimate social proof. We also like the booking module as it allows those who are seriously interested in your club to schedule bookings directly from your website. Besides, there’s social integration to help grow your night club and a blog to boost your website traffic. 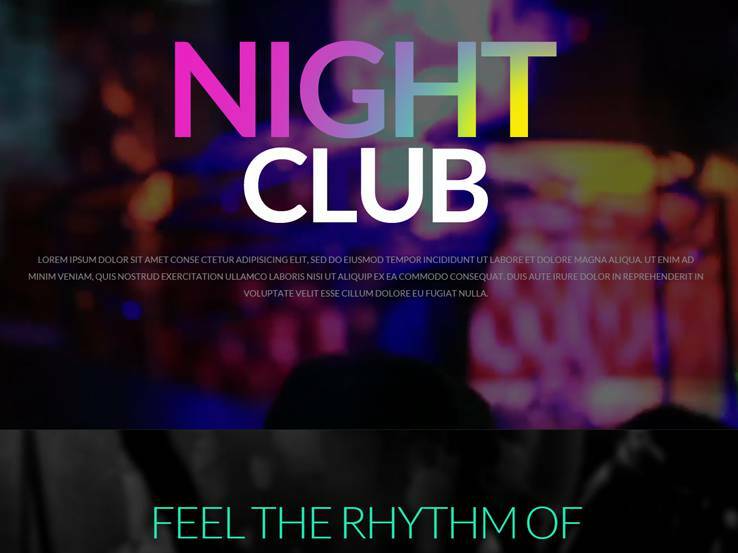 Night Club is a modern and elegant WordPress with big and bold elements. It comes with impressive features such as an events section to keep people posted on any upcoming shows and performances at your night club, a gallery that you can use to showcase photos of past nights and attract more people to your club, as well as a clean and simple blog to help generate more traffic to your website. The fullscreen front page slider is great for highlighting important aspects of your establishment, and you can easily link to your social media pages and display your contact information at the bottom. Along with multiple customization options, multilingual support, a responsive design and lifetime updates, the Night Club theme is a solid choice to go for. Night Rock is a music-focused WordPress theme with refreshing dark colors that make it a great choice for night club websites. This template comes with a simple Mp3 player, playlist management, and an events manager complete with a countdown timer. You can upload mp3s or embed playlists from SoundCloud. Integration with the WooCommerce plugin means you start selling products from your website within minutes, while social media integration helps spread word about your club. Additionally, the Night Rock theme supports Google maps, so people can easily find your location. The Pleasure theme was designed specifically for night clubs who want to show the world how cool their clubs are. 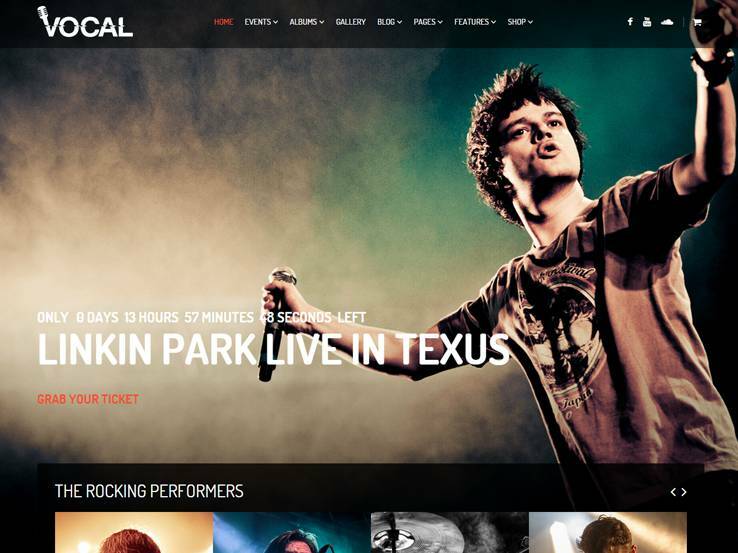 It features a dark color scheme, an audio player with video integration, and the ability to sell tickets from your site. Showcase photos of your club using the gallery to generate interest about your club and attract more customers. The in-built events management system lets you promote your upcoming shows, while the blog is great for sharing updates with your fans and growing your website traffic. Besides, the Pleasure theme is easy to install and configure, so you won’t need much time from your busy schedule to setup your website. 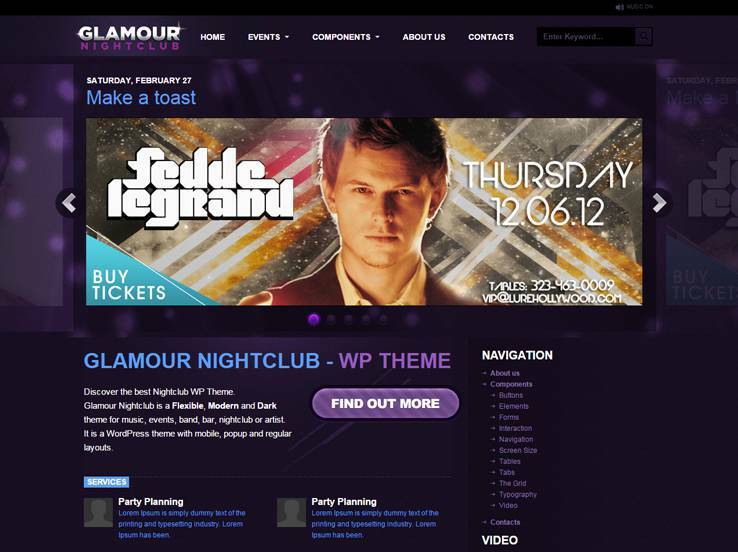 The Glamour Nightclub theme was designed with night clubs, bars, artists, musicians, and bands in mind. It comes with a clean layout with dark colors, a gorgeous slider that will bring your site to life, video support, and a responsive design that looks awesome on all screen sizes. Display your upcoming events and generate more interest in them by adding information about the artists and DJs coming to perform. Moreover, the Glamour Nightclub theme offers social media integration to supercharge your marketing, a gallery to show off photos of your past nights, and testimonials to boost your credibility. 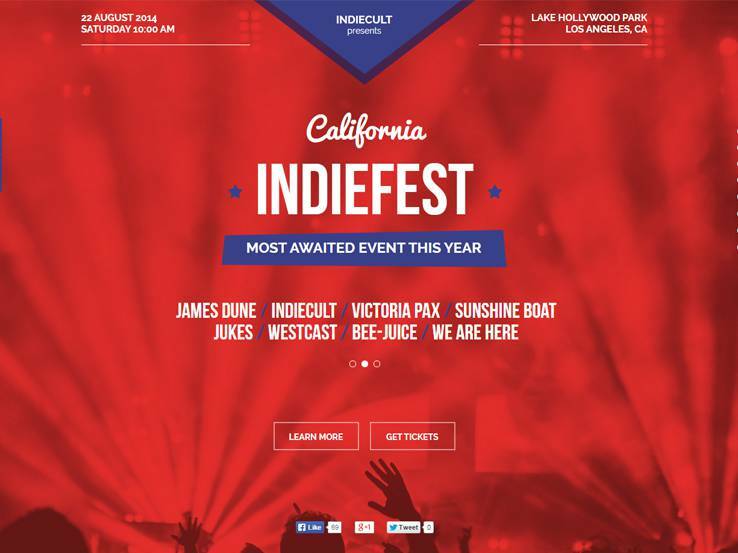 Consider the IndieFest theme if you’re looking for a creative solution to promote your events online, present artist or DJ information, sell event tickets and even attract sponsors for your events. The theme has a colorful design with well organized sections, a fantastic design that’s perfect for highlighting your best events, and parallax effects that’ll make your website more captivating. We like that the template is user-friendly and fully editable even for non-programmers. You can customize every aspect of the theme to match your style, and you’ll also find several ready-made page templates to get you started faster with sections such as about us, testimonials, artists, tickets, and more. Also, you’ll find Google maps to show your location and social links to connect with different platforms. 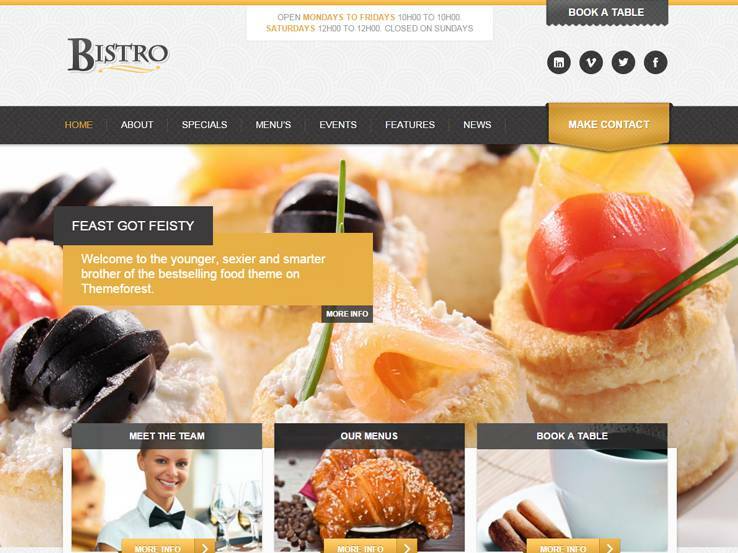 The Bistro theme is a great option for service-industry businesses such as restaurants and diners. Some of its impressive features include a booking system, food menus, galleries to showcase photos of your business, and an events module to display your upcoming programs. The template makes it easy to manage your specials and promos and boost your sales. You can also showcase your team members and display customer testimonials for the ultimate social proof. Besides, you’ll find a beautiful home slider to highlight your best content, social icons, and a blog to boost your website traffic. With the Nocturnal theme, you can let visitors listen to music from your website, show off photos of your club, add flyers and posters to promote your upcoming events, and more. Geared towards night clubs and bands, the template features a simple but innovative design with dark colors, stunning sliders, and mobile-friendly layouts. The blog provides a great opportunity to share updates about your business and generate more traffic from social media and search engines. Moreover, social icons are included so people can easily follow you and spread word about your club online. You’ll also find translation tools if you’d like to localize your website and an intuitive theme options panel for customizing the template. Meet IronBand, a powerful and unique WordPress theme with a rich set of features for your night club or bar website. It has an events module to display information about upcoming gigs at your club, an mp3 player to keep your site visitors entertained, eCommerce support to easily sell your merchandise online, and social media integration so you can easily connect with people on different platforms. Furthermore, the IronBand theme has video support and is image-friendly. This provides an opportunity to share videos of your past nights besides photos of your business. You’ll also find a blog to boost your traffic, a newsletter module to collect emails, attractive sliders, and a user-friendly control panel with lots of easy customization options. The Vegas theme’s responsive design and Retina-Ready nature provides for a crisp and dynamic display on all device types. The template comes with a dark color scheme, stunning sliders and carousels that’re perfect for highlighting photos of your night club or bar, social icons to boost your visibility online, and eCommerce support if you’d like to sell your merchandise online. The blog offers the opportunity to share updates with people interested in your business and generate more traffic to your website. On top of that, you can easily translate the theme and display your site in different languages. 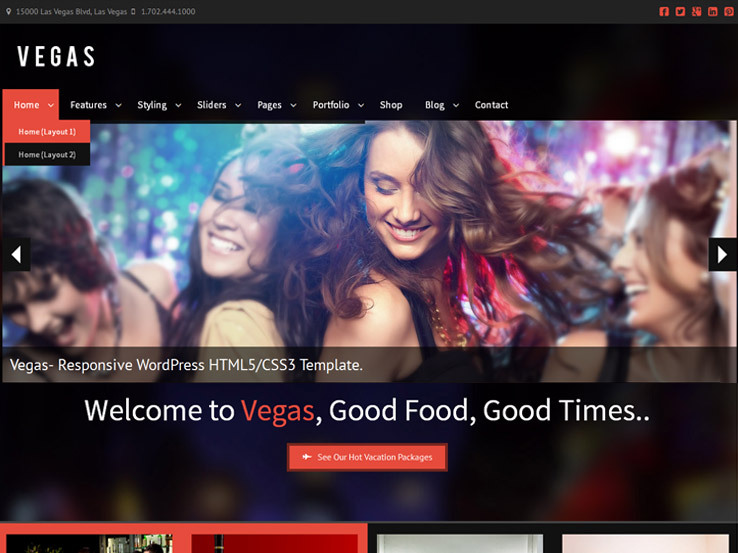 Along with unlimited color options and hundreds of fonts for branding purposes, pricing tables, ready-made page templates, and audio/video support, the Vegas theme packs a powerful punch. The Cafemio theme offers a modern, stylish, and unique design for clubs, bars, restaurants and just about any service-industry business. The fullscreen background slider will charm users upon landing on your site, while the responsive audio player will help keep them entertained. Create photo and video galleries of your establishment and show people what they can expect when they come visiting. The reservation form makes it possible for people to make bookings from your website, while the translation tools allow you to localize your website. Moreover, the Cafemio theme’s back-end is bounty with customization options. You can easily set colors and fonts to match your brand, change layouts, add more features using shortcodes and widgets and much more. With a creative and modern design, an online reservation module, custom post type for restaurant menu, social media integration and photo-friendly layouts, the Magtruetitude theme offers a fantastic choice. 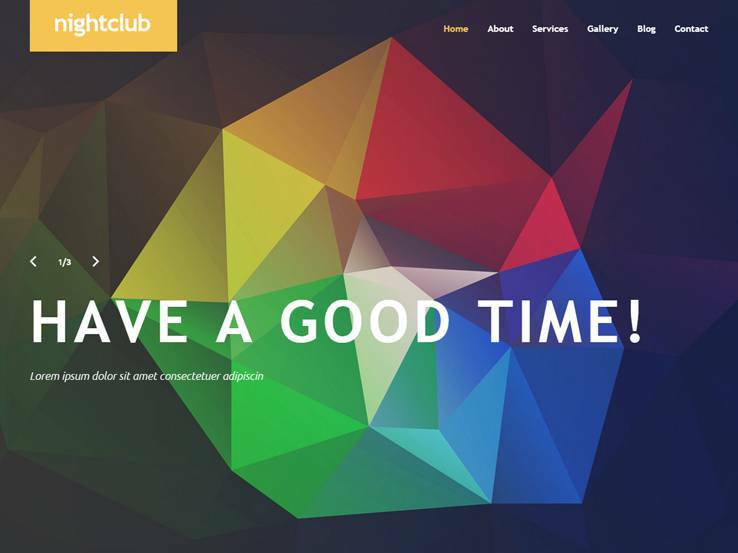 Use it to build a classic website for your night club, bar, or restaurant. The theme comes with dark colors, but you can easily set your own colors from the back-end using a color picker. Besides, you’ll find custom widgets for displaying things like your restaurant location, contact details, schedules and Flickr feed. Consider the NightClub theme if you’re looking for a fun and gorgeous template with bold elements that speak to your face. It features a large and attractive slider that’s great for highlighting photos of your club on the homepage. Furthermore, there’s a fantastic gallery module that offers several designs for displaying more of your photos. Use the blog to share updates about your business and grow your website traffic, and the available translation files to display your website in your preferred language. In terms of customization options, you’ll find multiple color options and hundreds of fonts for branding, custom post types, shortcodes and custom widgets to easily add things like your social media icons. The Club theme creates a fantastic night club atmosphere thanks to the muted light and dark color shade. It offers a nice option to announce your upcoming shows on the internet, showcase photos of your past nights, share updates with those interested in your night club and encourage people to visit. The blog is a great tool for generating traffic to your website, while the included social media buttons will help in distributing your updates around the internet. You’ll also find a user-friendly admin panel with lots of options for controlling the look and feel of your website. The Music Life theme brings a beautiful design with nice colors, responsive layouts that look fantastic on mobile devices, sliders to show off photos of your night club, and translation tools for those who’d like to display their websites in different languages. Create photo albums with the gallery module, and share updates using the blog and attract more people to your website. The template is easy to setup and customize even for those with the least coding knowledge. From the back-end, you can change colors, fonts, logos, header styles and more without touching a single line of code. Besides, there’re shortcodes and custom widgets to easily add more features and functionalities to your website. 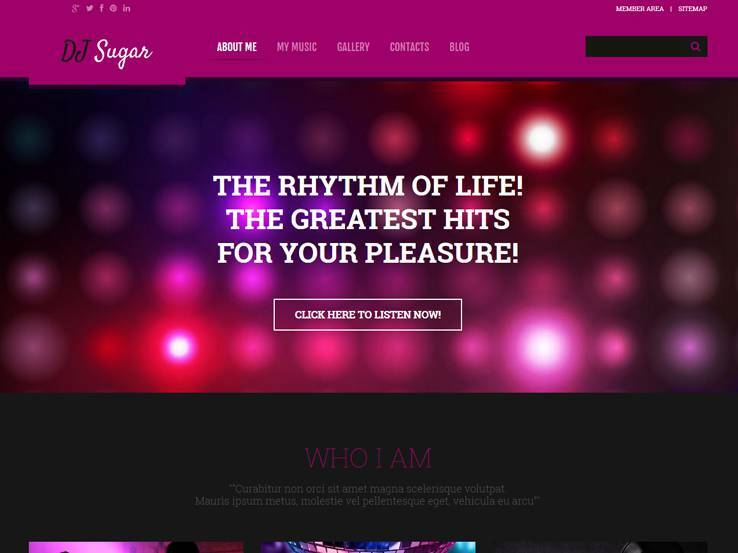 We like the DJ Responsive theme for clubs and bars because it helps create the kind of fun and relaxed atmosphere you’d want your customers to enjoy on their weekend outings. The homepage is elegant, with well-organized sections to display things like testimonials, and information about your club and any artists or DJs coming to perform. Like most themes on this collection, you’ll find a blog to share your updates and generate more traffic as well as a gallery to showcase photos of your club. You can also let people subscribe to receive email updates, and connect your social media pages so people can easily follow you and share your content. Meet Nightlife, a modern, elegant, responsive and photo-friendly WordPress theme by TemplateMonster. The template comes with impressive media support, allowing you to include videos and create galleries to show off photos of your customers enjoying their nights at your club. Display customer reviews to help boost your reputation, and add music mixes to keep users entertained when on your site. In addition, there is a fantastic slider to highlight your best photos on the frontpage, translation tools, social media integration, and a wide range of customization options to make the theme your own. 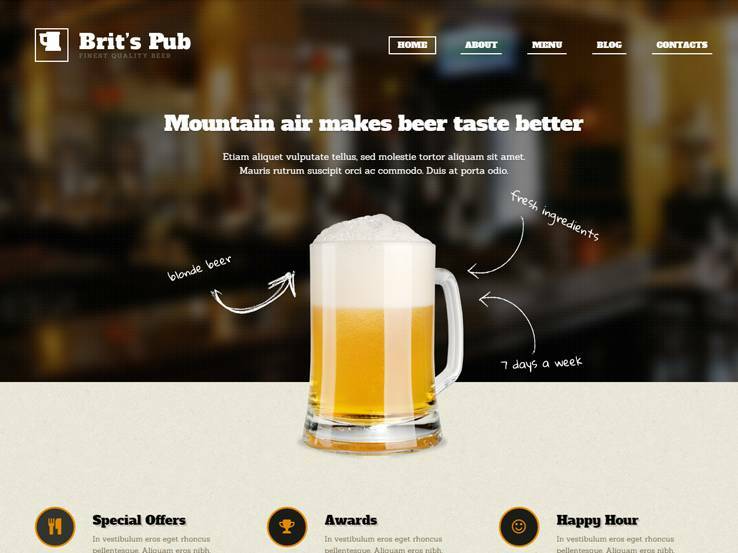 The Beer Pub theme is another fantastic product from the TemplateMonster team. It offers a quality design with a creative header style on the homepage and lots of well-thought-out details. You’ll find an awesome gallery module to showcase photos of drinks, revelers and other aspects of your club, as well as a custom menu page for presenting your menus. Moreover, you can display your opening hours, and add Google maps so people can easily find your location. Along with a blog to boost your traffic, social icons to connect with people on different platforms, shortcodes and widgets to add features to your site without coding, and multilingual support, the Beer Pub theme is a quality option. 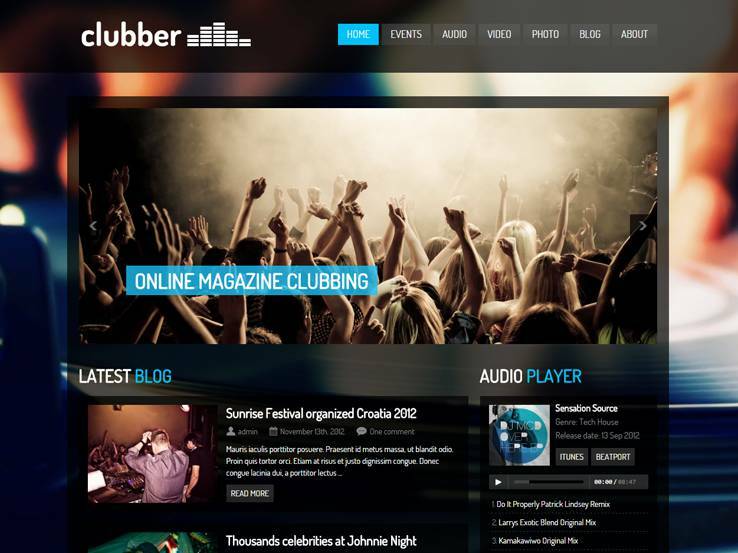 The Clubber theme is a fantastic choice, considering that it comes with an events management module, a music player, video support, social media integration and a beautiful gallery that lets you add as many photos as you’d like. You can display your upcoming events, along with ticketing information and details about the event duration. With the audio module, you can embed music from Soundcloud and feature full albums from artists. You can also embed videos from platforms like Youtube and Vimeo. The slider is great for highlighting your best content, while the blog provides a platform for sharing updates about your club or bar. Lastly, you’ll find a powerful theme options panel that allows you to adjust almost any element on your website. 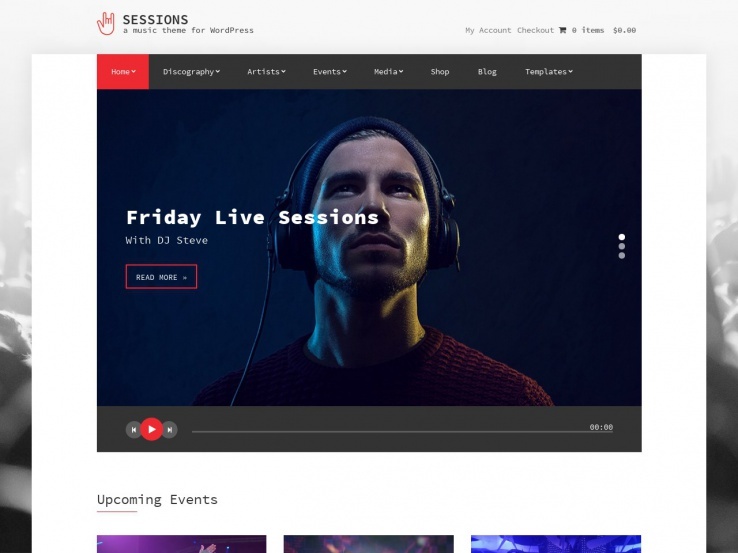 From CssIgniter comes Sessions, an awesome WordPress theme for businesses in the entertainment industry. The template comes with a clean and modern design, along with a useful set of features such as booking forms, an events management system, and an audio player that will turn your website into an entertainment hub. You can feature artists and their albums, display your upcoming events, and showcase photos of your club or bar using the gallery. eCommerce support makes it easy to sell your merchandise online, while the blog provides an opportunity to generate website traffic from search engines and social media. You’ll also find several page templates to expedite your website creation, video support, and social media integration including a nice Instagram feed that displays photos from your Instagram account. 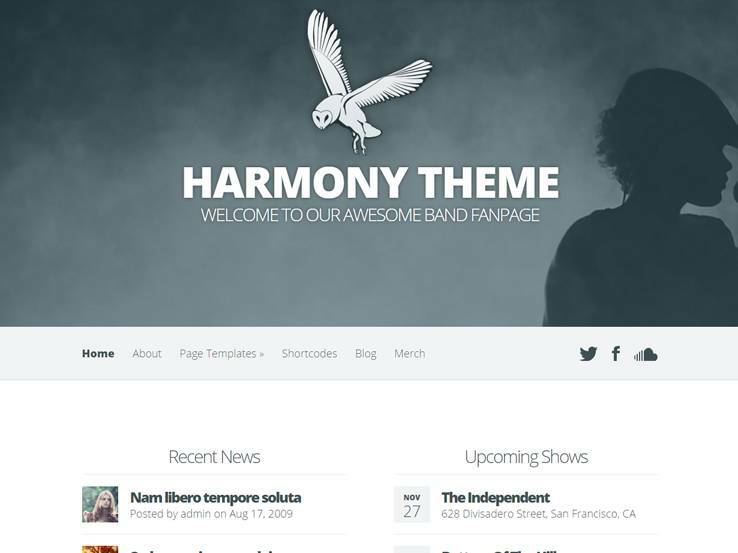 The Harmony theme comes from the Elegant Themes company, so you’re assured of a quality product backed with superb customer support. This flexible template comes with a bold style, along with some impressive features such as the ability to play music from your site, share your upcoming events, and create galleries to show off photos of your club or bar. Several page templates are included with your purchase, which is awesome as it means you won’t need to create most of your pages from scratch. Also, there’s eCommerce integration if you’d like to sell merchandise, a blog to share your updates, social media integration, and an intuitive theme options panel that lets you control your website without touching code. The Night theme comes with a beautiful dark color scheme and a clean and simple layout. The full-width slider offers plenty of opportunities to promote your upcoming gig or share your latest track. You can embed your tracks directly from SoundCloud and the blog is a perfect way to share band updates with your fans. Several page templates allow you to share your discography as well as photos and videos. A Tour page is also available so your fans know when you will be performing in their area. The theme is fully responsive and can be customized easily on the backend. You can upload a custom background photo for each page as well as a custom favicon. Custom menus make navigation easy and the entire homepage is built with widgets which provides you with somewhat of a drag-and-drop interface. Customize your colors and take advantage of various social media icons to connect with your fans on places like Twitter and Facebook. 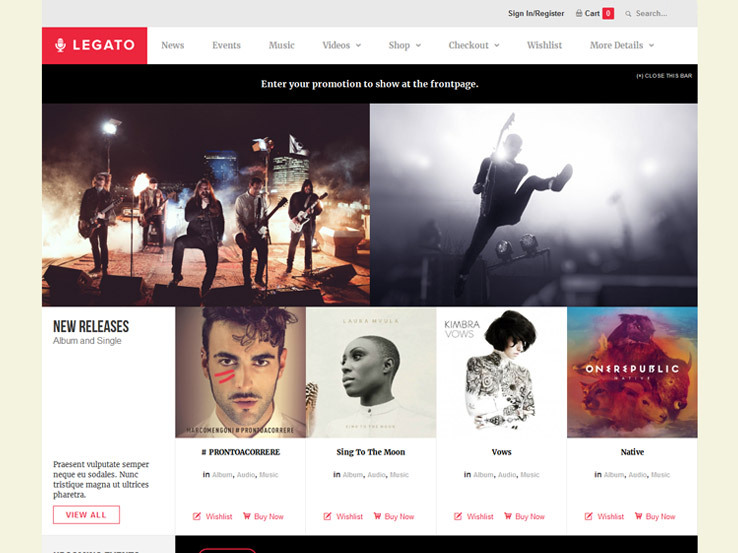 The Legato WordPress theme happens to be a theme for bands and artists, but it can just as easily be used for a nightclub website. 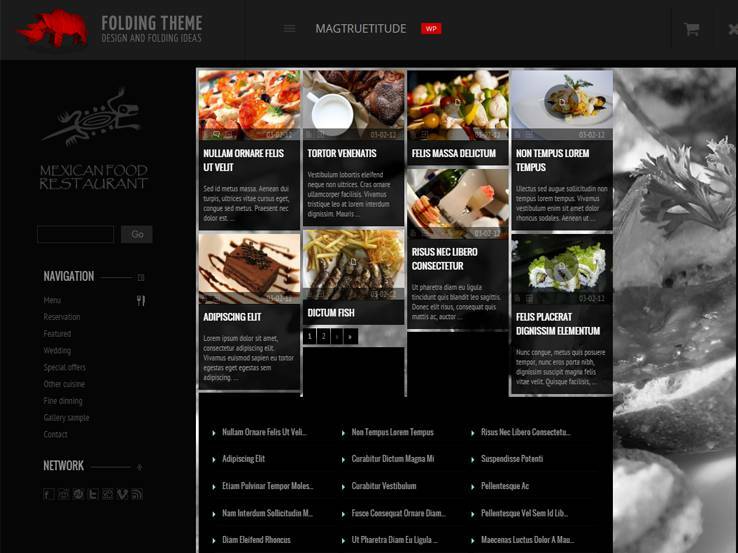 The theme provides both white and black colors, creating a professional, yet creative flow for customers and fans. The responsive design is essential for the nightclub crowds, particularly because many of the customers are young and they may be heading to the nightclub when looking up directions, pricing, and images. The events management module is one of the more important tools when working with the Legato WordPress theme. It allows you to adjust when you want to tell people about upcoming events and it has options for showing dates, images, and other information. The event bookings are ideal for nightclubs because it allows your visitors to quickly buy their tickets and eliminates the need for phone calls and manually entering the bookings into your system. Custom contact forms makes it easy for anyone to inquire about the events in your nightclub. Music and video post types are a wonderful way to show the atmosphere of your night club. Sell merchandise through the WooCommerce plugin and ensure that you always have revenue coming in at all times. Ticket management is done on the backend, while customers can see their purchased tickets from a frontend interface. Vendor commission support is an interesting feature because it lets nightclubs partner with vendors and share a little bit of the earnings for a night or two. Customers have the ability to create a product wishlist and the easy product submission form makes your life much easier. Overall, it’s a quality theme for your nightclub, and the localization is yet another reason to check it out.